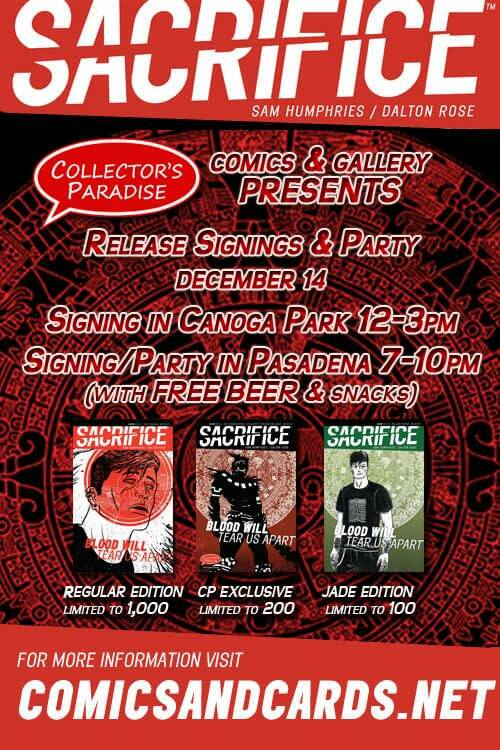 From The Writer Of Our Love Is Real Comes A New Limited Run Comic – Sacrifice! Home » Comics » Digital » From The Writer Of Our Love Is Real Comes A New Limited Run Comic – Sacrifice! I gave you fair warning last time. I’m giving you even fairer warning this time. 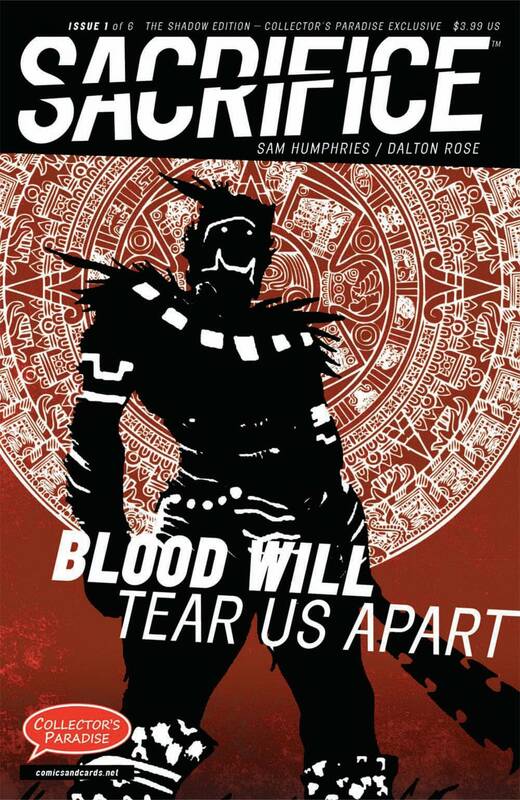 And Bleeding Cool is the first place you’ll be hearing about it. Our Love Is Real, Sam Humphries’ last self published comic, became a $100 comic in seconds, and went to five printings – and then the Image Comics edition. 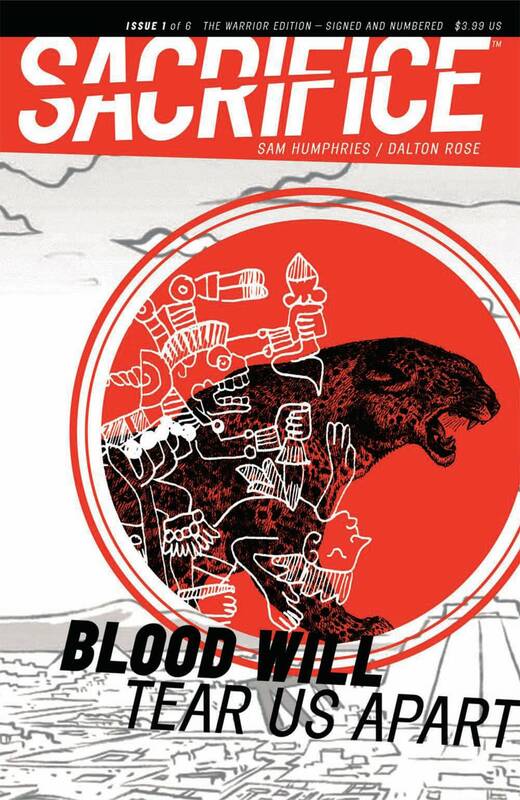 Sacrifice is a new six issue comic book series by Sam Humphries and Dalton Rose. Colour, 24 pages of story, $3.99, and it goes on sale on December the 14th, self published, self distributed and severely limited in numbers. It’s the ectasy generation plunged into Aztec society, one young man taking a psycedelic trip to the past. A very messy, ugly and brutal past. 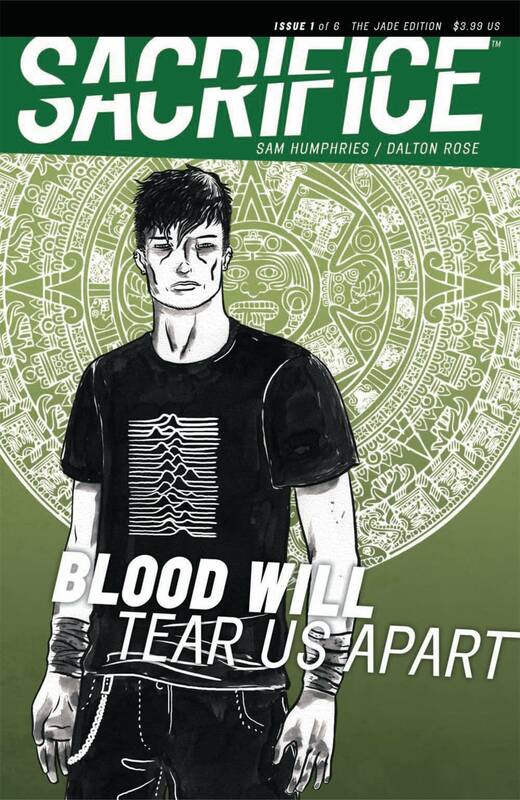 And yes, that is a Joy Division reference on the covers. 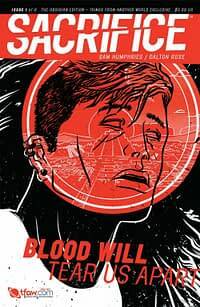 It can be bought in certain stores (list at the end of this article), through online mail order from Things From Another World (including being able to order all six issues at once) and day-and-date digital with Comixology and Graphicly. 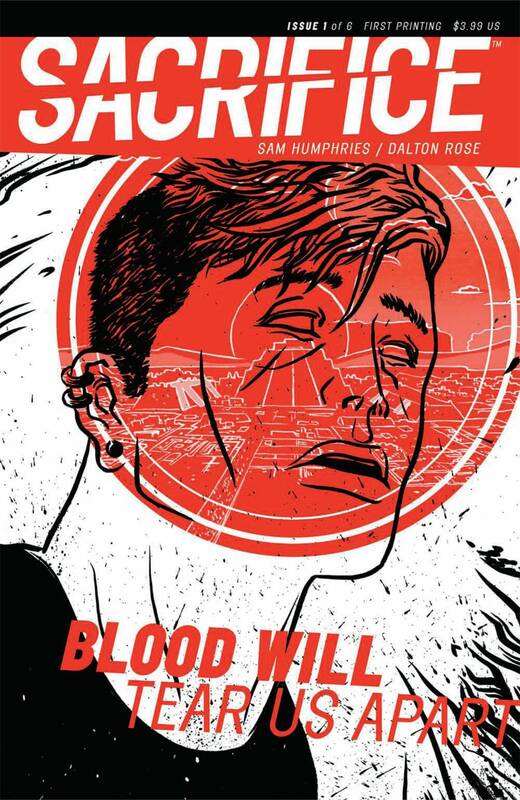 The comic will be available for a limited number of comic stores in the USA and Canada. Humphries will continue to take orders from additional retailers until December the 6th – though be warned, the New England Comics Retail Alliance have an exclusive on the comic in that region. 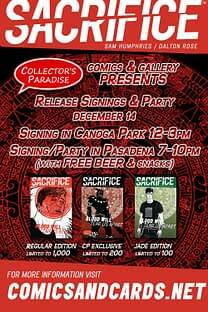 The first printing of Sacrifice #1 will be 1,100 (Dalton Rose cover, above, left).The Jade edition, (above, right) will add a further 100 copies. Indeed, variant limited edition covers will bring the total copies in circulation up to 1,730. In comparison Our Love Is Real had a first print run of 300. Of course, there’s a lot more interest now. Subsequent issues will be similarly limited. And frankly, the standard first printing is going to be hard enough to get, as it is. Humphries made this work with one comic. Can he make it work with six? Let’s find out. There’s more at the Sacrifice! website, here – http://www.aztecsforever.com. 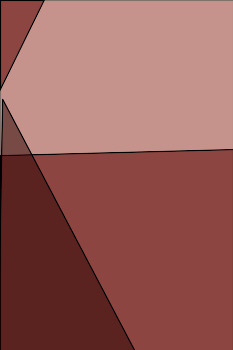 Here’s the Diamond Comic Distributors-style solicitation, even though Diamond won’t be getting a whiff of this. What happens when you’re ripped from the 21st century and thrown into the middle of one of the greatest — and most bloodthirsty — civilizations in human history? How do you survive a strange world of war, blood, sacrifice, and death? 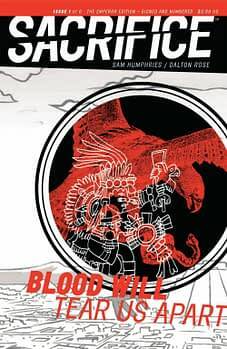 Join Hector, a dude on a one-way trip through the past, the present, and the psychedelic into the the glory of the Aztec Empire in SACRIFICE — a new comic book by SAM HUMPHRIES (writer of OUR LOVE IS REAL and one of Wizard’s “Five Writers to Watch in 2011”) and rising star DALTON ROSE. 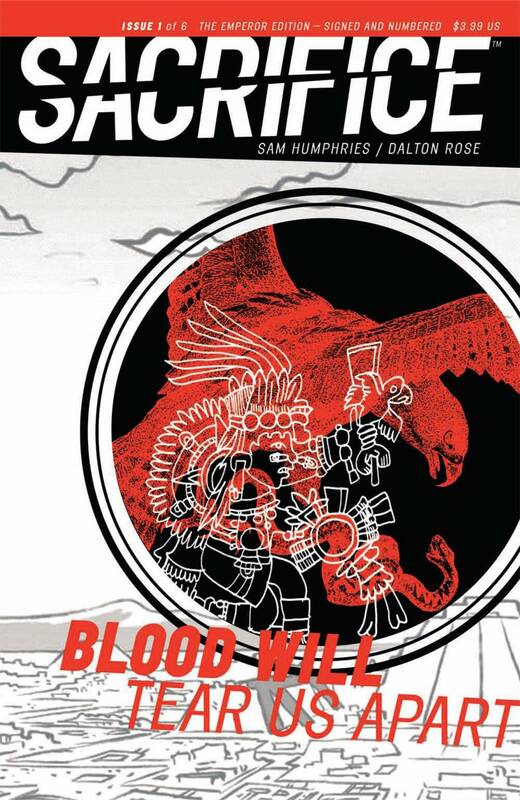 December 2011…BLOOD WILL TEAR US APART! Here’s a list of the retailers who, so far will be stocking the comic. My advice is to arrive early. Possibly with a sleeping bag. A Taunton for preference.